Did Scientists Just Discover an Earth-like Planet Nearby? Not So Fast. 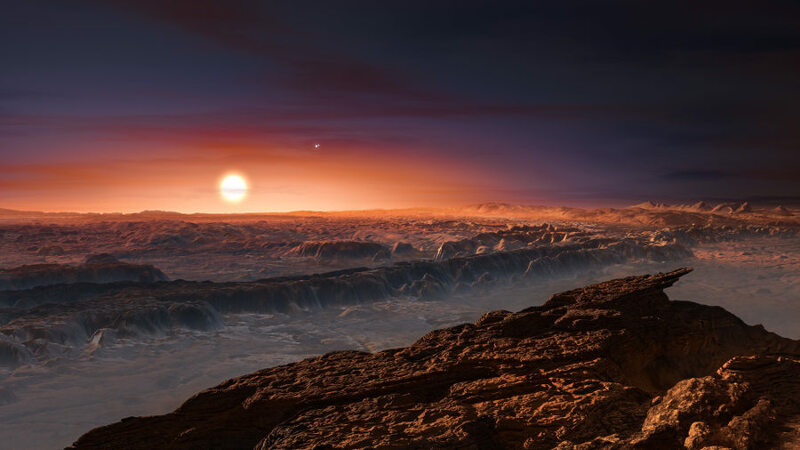 This artist rendering provided by the European Southern Observatory shows a possible view of the surface of the planet Proxima b orbiting the red dwarf star Proxima Centauri, the closest star to the Solar System. By now you’ve probably heard that astronomers have found a terrestrial planet candidate orbiting the nearest star to our Solar System, a red dwarf named Proxima Centauri. This is the smallest member of the three-star Alpha Centauri system. They’ve dubbed the planet Proxima b. They discovered Proxima b using the Doppler method, which uses a sensitive spectrometer on a telescope to detect periodic tiny shifts in the spectrum of a star to infer the presence of an unseen companion. But this method doesn’t reveal the size of the planet. Reports that the planet is approximately Earth-size and terrestrial (that is, rocky like the Earth) are based on computer models. Of course, by now we’ve all grown accustomed to breathless reports about discoveries of “Earth-like” planets around other stars. In every case, the question is, “How Earth-like?” After all, Mars is by far the most Earth-like planet we know of, and it is lifeless. So how Earth-like is Proxima b, and how likely is it to host life? The authors of the Nature paper announcing the discovery note that the planet orbits within its host star’s “habitable zone,” where it is not too hot and not too cold to maintain liquid water on its surface. But this is only one of many ingredients that a planet needs to have any hope of hosting life. For instance, Proxima b orbits very close to its host star. So it is almost certain to be “tidally-locked.” Either one face perpetually faces its sun, as our Moon faces the Earth. Or it’s in a 3:2 spin-orbit resonance, like Mercury with the Sun. Either case leads to large differences in temperature between day and night, making the planet unfriendly to complex animal life. This can only be alleviated with a thick, mostly carbon dioxide atmosphere, but that itself would be hostile to oxygen-breathers. The slow rotation also means it probably doesn’t have a magnetic field as strong as Earth’s, which is important for shielding a planet’s atmosphere from the star’s wind. That wind can strip off a planet’s atmosphere, as happened to barren Mars. The red light from the host star and the illumination pattern make trouble for photosynthesis. While none of these is, by itself, an insurmountable problem for habitability, taken together they whittle down the odds that Proxima b is life-friendly. But wait, there’s more. We can’t just assume a planet is born with the same endowment of life-essential ingredients as the Earth. We don’t know how much water Proxima b was born with. There are several possible scenarios that could have led to a planet with its properties, and some result in dry dead ends. Even too much water can be a bad thing if the planet is completely ocean covered. When it comes to habitability, there are far more ways for planet formation to go wrong than to go right. There is much more to be said. But even to the expert, the technical details are complicated. It’s OK to say, “I don’t know — the jury is still out on this.” Still, sometimes, hidden amongst all the complex arguments and counterarguments, there is a decisive fact that should settle the debate. Astronomer Artie Hatzes points to just such a fact in a companion article in Nature. Hatzes is a reliable fellow traveler in exoplanet research who started in this field about the same time I did. He notes that the high energy radiation emitted by the flares on Proxima Centauri poses problems for life. In fact, it’s been known for over a decade that flares on red dwarfs would probably be highly damaging to life attempting to gain a foothold on any planets in their habitable zones. Indeed, I would say it is a showstopper. As exciting as it would be to find a habitable planet in the closest star system to our own, Proxima b just doesn’t measure up. It’s always nice to see the truth blow away a hurricane of breathless fantasy. Thank you, Guillermo.